This is one of my favorite ground lamb recipes, and you won’t even miss the bun! From Mark Bittman’s The Food Matters Cookbook: 500 Revolutionary Recipes for Better Living. As a bonus, it uses spinach, although you could substitute Swiss Chard or Kale if you prefer. I made the rice in a rice cooker, doubling the recipe since we had a pound of ground lamb to use up. In hindsight I should have followed the directions, which are to make the rice in a saucepan, cover with water by about an inch, bring to a boil, cover and cook about 30-35 minutes or until it’s mostly done but still a little wet. I think the extra wetness would have helped the burgers stick together better. Since I made it in a rice cooker, it was fairly dry. Bittman says to make the spinach next, but I saved that for last since I like my greens freshly sauteed and not clumping together. Either way, they’re just sauteed in some olive oil along with a little garlic. To make the patties, mix up the rice, pepper, ground lamb, onion, oregano, cumin, and feta. I added some chopped chives as well. Form into 4 patties (8 if you’re doubling the recipe like I did). Fry them in a pan until the meat is cooked through, about 5 minutes per side. To serve, place a patty on top of a mound of spinach. Mix up a little sauce of yogurt, lemon juice, and fresh chopped chives if you like. The Verdict: The sauce really made this dish. Otherwise it would have been REALLY dry. I loved the classic flavors of the burger, and the rice made them nice and crispy. More Burgers & Dogs from Sunday Supper bloggers! 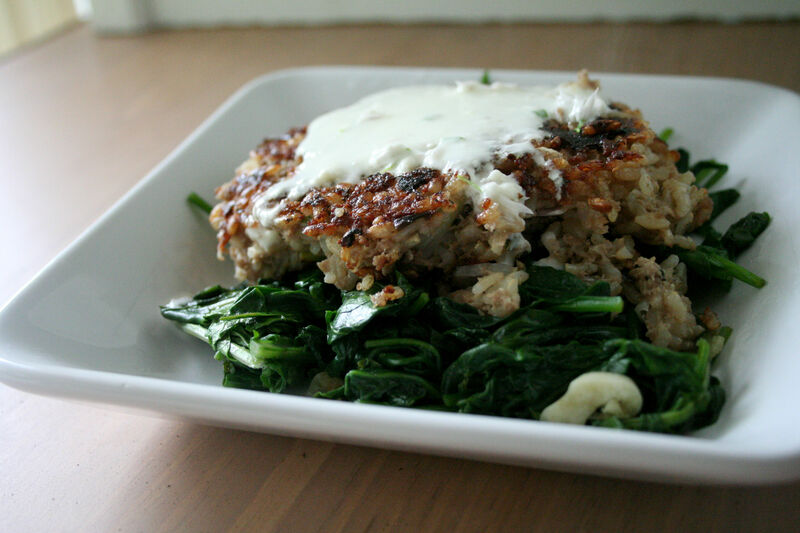 I love the whole sauce idea…kind of like a tzitziki, but not. I want to go buy some lamb now…. This is my kind of meal. lamb is a favorite in our house and I’m always trying to get Steve to eat healthier – this may just be the ticket! 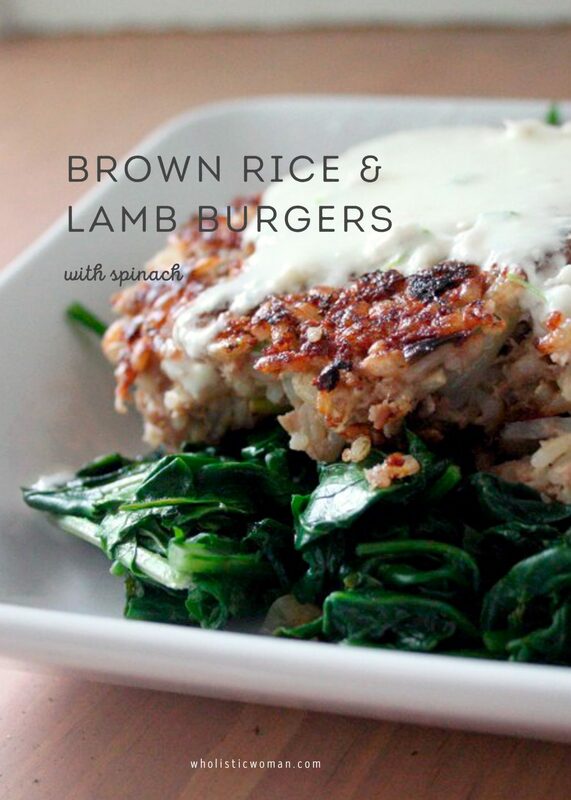 I love lamb and brown rice so this combo must be amazing! I love lamb burgers as a change from beef burgers. The flavors in this sound great.